Residents had to be evacuated from their homes as the Explosive Ordnance Disposal unit disposed of the suspicious package. David Gunson, 73, from Hailsham was found with serious injuries on a verge on the A22 at around 4.38am on Friday 21st September. Investigators found what they believe to be a "large-scale" operation in a warehouse in Hailsham. Officers arrested three men. 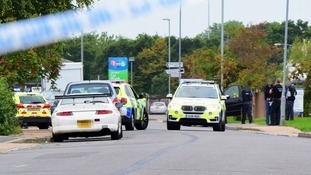 Three men have been arrested on suspicion of firearms offences following a National Crime Agency operation in Hailsham, East Sussex. Six thousand tonnes of scrap metal are on fire in Hailsham in East Sussex. Firefighters are still at the scene of a large blaze at an industrial unit in Hailsham. The fire broke out at Diplocks Way just before 10pm yesterday after a number of repeated 999 calls. East Sussex Fire and Rescue Service is asking locals to keep doors and windows closed. The operation is expected to continue for some time. Police are appealing for witnesses to a fatal crash in Hailsham last night. Officers were called to Harmers Hay Road just before 11pm. A 93-year-old man from Hailsham was driving a Suzuki Alton when the vehicle left the road and collided with a bungalow. He died at the scene. No other vehicles were involved and no one else was hurt. "We would like to hear from anyone who may have seen this collision." A shop manager has appeared in court, charged with attempted murder and arson with intent to endanger life, in connection with a fire at a nail bar on Hailsham High Street in March. A five month old baby, a man and a woman were seriously hurt. Shop manager, Duc Bac Vuong, 51, appeared at Brighton magistrates court today. He will be back in court on July 30. A Landlord from East Sussex has been fined more than £2,000 for failing to make repairs and leaving tenants with leaky showers and broken toilet seats. 59-year-old Alan Filsell of London Road, Hailsham, ignored repeated requests to make repairs to a block of bedsits, which are located on the same road. Wealden District Council says the condition of the property failed to meet required standards and contained potential hazards. The property, called Gidleigh Lodge, has shared facilities and housed up to 20 people. – Councillor Graham Wells, Cabinet member for Housing and Benefits.